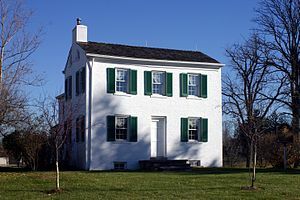 Today, Cary Cottage is listed on the National Register of Historic Places and is located on the grounds of Clovernook’s Cincinnati facility, 7000 Hamilton Avenue in North College Hill. From 1832-50, the cottage was the home of the Cary family, early settlers to the area. The Cary family tree can be traced back to Sir Thomas Cary, a cousin of Queen Elizabeth, through John Cary who came to Plymouth in 1630. Two of the daughters who lived in Cary Cottage, Alice and Phoebe Cary, were well-known poets of their day.